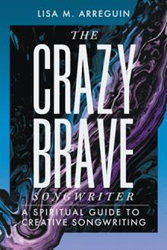 Lisa M. Arreguin’s music book, “The Crazybrave Songwriter: A Spiritual Guide to Creative Songwriting” (published by Balboa Press), offers Arreguin’s perspective on songwriting, encouraging musicians to “find their song,” discover what’s inside them, and love their “crazybrave” journey. The book is available for purchase at: https://www.amazon.com/Crazybrave-Songwriter-Spiritual-Creative-Songwriting/dp/1504399978. Using personal stories highlighting her 20 years of writing songs, Arreguin encourages songwriters to believe in the authenticity of the songs they write. The book guides readers in songwriting. Arreguin offers specific creative techniques and discusses how to break-through psychological roadblocks while connecting with spirit for musical inspiration, and courageousness in the songwriting process. Lisa M. Arreguin is a songwriter, recording artist, vocal coach, and speaker. She earned a master’s degree in psychology from California State University, Los Angeles, and founded the music company Voice & Sound. Arreguin lives with her husband in Southern California; together they own Love and Laughter Music Group, a recording studio and music complex, which also houses Reaching Youth Through Music Opportunities, a nonprofit organization for youth focusing on music, technology, and the arts.